Your loyal customers are the best potential advocates for your brand, but most of the time they forget to leave a review. 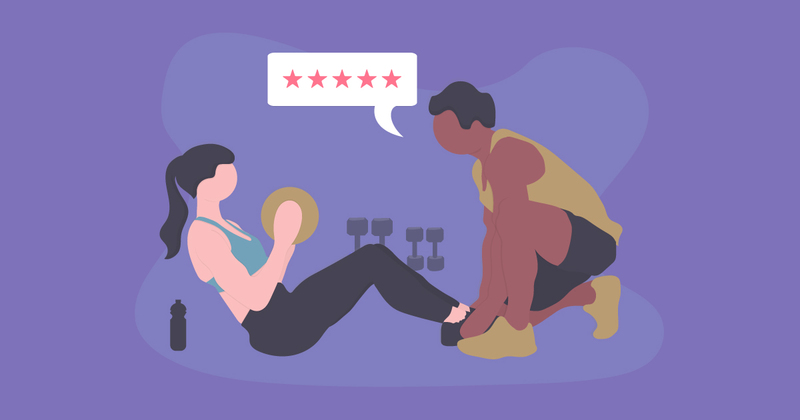 How do you turn customer loyalty into powerful 5-star reviews? Everyone has at least one business they’ve used forever. The one that can do no wrong, even when they do. For many, it’s a coffee shop. For others, it’s a dry cleaner. Then there’s always the legendary regulars that speckle bar tops worldwide and swear by one bartender’s particular pouring style. And, of course, we can’t leave out the countless fitness fanatics that frequent the same gym daily for years on end. Whatever the case may be, each of these people love the businesses they continue to go to for specific and personal reasons. They might even have valid insight on things you could improve in your business that you might not otherwise see. The trick is to capture their feedback in a public, measurable, and reliable manner. Here we’ll talk about why you should try to get reviews from your most loyal customers and how to do it. Why get reviews from regular customers? Loyal customers not only spend more money at your business over time, but they also speak the most powerfully to others. Who better to learn about a business from than a person who’s there all the time? Harness the investment you made to get your regular customers to start coming to your business as well as stick around. It’s cost-effective to simply gather one more 5-star review from someone who knows what there is to love about your products or services. The trick is getting them to leave the review at all. Ask for the review, but not as a favor. The first step in getting reviews from your most frequent and loyal customers is to simply ask without making it sound like a favor. You’re not looking for a handout, help, or a favor. You’re giving your customer a tool to be heard and feel important. This means face to face conversations between empowered employees and customers. There are a few ways you can go about asking without making it sound like you’re placing a burden on your customer. Below are four examples of ways you can empower your customer to leave a review versus asking them as a favor. They always get the same thing and rave about how much they love it every time. They compliment your service and how much they love that your business is there for them a lot. They suggest an improvement or make a small complaint. The last situation could go both ways. It’s important to always use your discretion when asking someone to leave a review, even regulars. Every moment and every customer is different, but turning customer loyalty into great reviews also requires loyal customers. We're compiling the best ways to gather more reviews. Discover review marketing strategies and other relevant advice in our newsletter. Get more loyal customers to ask for reviews from. There are many ways you can build up your loyal customer base, but the most obvious is to create a solid customer loyalty program. Points/spend programs: A points program means that for every size of purchase, the customer receives a certain amount of points to cash in for something specific in the end. The spend program is similar. After the customer spends a predetermined amount, they get a discount on their next purchase. Tiered rewards levels: At each level of rewards, the customer gets a higher discount. The levels can be determined by amounts spent over time, visits to the store, or any other method you choose. Paid/VIP memberships: VIP memberships give customers added value, special treatment in some way, and maybe even free fast shipping. Your customer will pay on a regular basis or one time to become a VIP member. Usually, paid memberships are set up as annual subscriptions. Social good kickbacks: Let your customer know about your social good initiative by incorporating it into a loyalty program. This can be done similarly to the tiered rewards or points/spend programs. Instead of giving back to the customer, you’ll give to a nonprofit cause that your customers care about. Gamification: Gamify your customer loyalty program. Have a customer leaderboard. Give points and rewards at various levels reached. Gamifying your loyalty program might incorporate elements of other tiered and points-based programs as well. WiFi marketing: WiFi marketing can actually be used as a customer loyalty program. Each time your customer visits your store, you can set up your WiFi marketing platform to send them an email enticing them to return. You can even incorporate some of the loyalty programs above into your WiFi marketing strategy. The type of loyalty program you choose should depend on what your intended customer base will respond to. For example, affluent members of society would not be interested in a loyalty program that gives them a discount after they spend enough money. Instead, they want to feel like they did good in the world with the surplus of money they do have. In this situation, a high-end retailer or service provider might promise to give back to a cause that their customers want to support. On the other hand, a college student struggling to keep up financially would love the programs that give them a discount, gamifies their experience, or provides tiered rewards levels. If you’re not sure which would best fit your customer base, start asking your customers directly. Ask around and take an informal survey or send out an email and ask formally. Whichever kind of loyalty program you choose, make sure that your customers always feel valued. They want to know their opinion matters. Whether you use a loyalty program or simply ask for/suggest a review from your loyal customers, keep in mind that those customers already like you and what they get from you. For most of them, it’s a natural progression to leave a positive review and recommend you to others. Have you found success with your customer loyalty program or with simply getting reviews from loyal patrons? Tell us about it in the comments.